Wet Rooms are an increasingly popular interiors trend, greatly improving on the functionality of a typical bathroom. Warming the cold tiles of a wet room with floor heating enhances the sense of luxury and cleanliness of the room. Floor heating provides an ‘invisible’ heating solution meaning you no longer have to design your wet room around a bulky, cumbersome radiator. Heating your wet room’s floors also provides a greater sense of comfort and wellness to the room; wet rooms are almost always designed with tiled floor and walls and with underfloor heating, cold tiles under your feet are a thing of the past. Floor heaters are also much more energy-efficient than central heating systems, use a system with one of our Smart Thermostats and save both energy usage and money on your heating bills. Tiles have a high thermal conductivity which makes tiled floors perfect to be heated by an underfloor heating system. Tiles heat up quickly and retain this heat, meaning a fully tiled wet room can be efficiently transformed into a warm, cosy environment in which to relax. Wet rooms can be heated with either a water or electric floor heating solution. Whether you are retrofitting a heater into an existing wet room, converting a bathroom into a wet room or creating a wet room as part of a new-build construction project, Warmup provide a range of suitable heating options. A Warmup system can be quickly installed in your wet room by a qualified installer in as little as one day. Whilst installation can be simple and hassle-free, due to the nature of wet rooms, we advise speaking to one of experts for more information on how to achieve a successful first-time wet room installation. 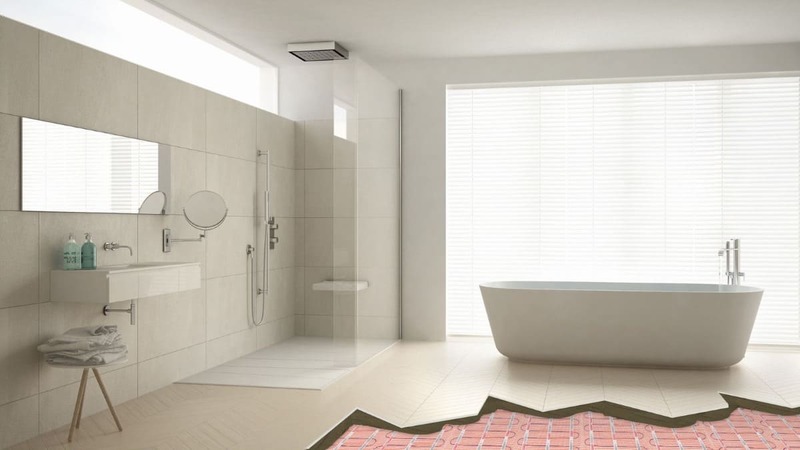 A warm shower tray underfoot as you take a relaxing shower is a wonderful experience and with Warmup’s floor heater’s, you can bring this touch of luxury to your wet room. There are some things to consider if you are pursuing this heating solution. If you are using an electric system, you will need a build-up of at least 12mm of screed and floor finish above the heater to be able to conduct the heat safely and efficiently – installing a shower tray directly on top of the heater would mean the heat cannot escape, resulting in the heater burning out. Get in touch with us if you have any queries or concerns. As well as heating your wet room’s floor and shower tray with a floor heating system, wet rooms are also the perfect space in your home to install a Warmup Wall Heater or other Bathroom Accessories. Imagine showering in a cosy wet room with both gently warmed floor tiles and wall tiles – by using underfloor heating with a Wall Heater your dream wet room can be a reality. Wall Heating systems are recommended for use with tiled or stone wall finishes and bring another layer of warmth and comfort to the room. These systems are ideal as a secondary heat source and assist in reducing the chance of mould build-up and are also great for wet rooms with higher levels of heat loss. Other heating accessories to consider installing in your wet room include Warmup’s range of Mirror Demisters and Heated Towel Rails. The Mirror Demister is perfect for keeping mirrors in wet rooms free from steam after a hot shower. The Heated Towel Rails feature Warmup’s advanced heating wire technology which rapidly dries towels dampened by wet room moisture, keeping them gently warmed and toasty. Whether you are building a wet room from scratch or retrofitting a heater with an existing bathroom, Warmup offer a variety of electric and water floor heating options to consider. The DCM-PRO System is the ultimate electric floor heater to use with tiled wet rooms. It offers a fast, even heat output and features a unique anti-fracture matting, which can help protect and prevent floor tiles from cracking due to subfloor movement. Utilising the DCM-PRO Waterproof Tape with this system is also always recommended for wet room specifications as it greatly enhances the impermeability of the heater. The StickyMat System utilises a self-adhesive backing for rapid installation times. The Loose Wire System provides great versatility and features the thinnest heating wire on the market. If you are retrofitting a water underfloor heating solution into a wet room, by which we mean installing a heater within an existing wet room or converting an existing bathroom into a wet room, the Total-16 System is a great choice. At only 16mm deep, the Total-16 is Warmup’s lowest profile water heating system, so it is the perfect option for wet room’s where the ceiling height is fixed. The system features built-in insulation and uses aluminum diffusion plates to rapidly spread a consistent heat across the floors surface, at the optimal temperature for your needs. Constructing your wet room from the ground up? If you are building your dream home or working on a new-build project, many of Warmup’s water floor heating systems are suitable for use in a wet room. The Clypso Floor System offers gentle, energy-efficient heating for your tiled floor surface. It has been designed for use with floating screeded floors, a common subfloor for wet rooms and features insulation panels with a gridwork pattern for clear and fast installation of the heating pipes. A Warmup heater with accompanying insulation and a Smart Thermostat can be purchased from as little as £115 + VAT per square metre and with rapid installation times, you could have the wet room of your dreams for less than you may have thought.